New Hall Mill will be grinding corn again on Sunday May 14th, and the volunteer millers will be hoping that nothing goes wrong. One problem already experienced several times occurs when the grains of wheat are too soft and the wheat turns into paste which gums up the millstones instead of the fine flour produced when hard wheat is milled. No doubt this was experienced by millers in the past in rainy seasons, but they had a remedy. Soft grain could be spread out on the heated floor of a granary to dry out and reduce the moisture content. The granary would be above a room with a furnace, the ceiling of which would include special perforated tiles, known as Bridgewater tiles, so that the warm dry air could filter through the grain. One such Bridgewater tile has been found at New Hall Mill, while at New Shipton Farm, where successive generations of millers lived, a granary had been built on by one of the Twamley family of millers at New Hall Mill. The harvest of 1899 in England followed a particularly warm and dry Summer, so the ripened wheat in the fields was ready for milling without any drying-out period. Seeing this, an Erdington baker, Mr. Prosser, had an idea (this was long before the Guinness Book of Records) - to see if he could harvest some grain, thresh it, take it to the mill for grinding, and bake the resulting flour into bread all in one day. “This had never been accomplished in England before for the reason that the wheat had never been in a condition to grind on the same day that it had been cut”, reported the Sutton Coldfield and Erdington Times of August 19 1899..
Prosser purchased a field of ripe wheat from Farmer Ryland of Walmley Ash Farm, and the project began at 10.00 a.m. on Monday 14th August. About fifty kilograms of wheat was cut and threshed with sticks (no combine harvesters in those days). It was not far up Walmley Ash Road, through Walmley and down Wylde Green Road to New Hall Mill, where Benjamin Styles the miller was ready and waiting to deal with the large sack of grain. The grain soon passed through the great millstones and into the flour sack. Prosser took it away to his bakery and the loaves were ready to eat by six o’clock the same evening. Prosser was proud of his achievement, and sent two loaves off to Queen Victoria to “show what could be done in England”; one of these loaves is said to be still an exhibit in the Royal Collection. No doubt Prosser’s “Erdington Stores and Steam Bakery” benefited from the publicity generated by this stunt, and Benjamin Styles certainly made the most of it in his advertisements for New Hall Mill flour. 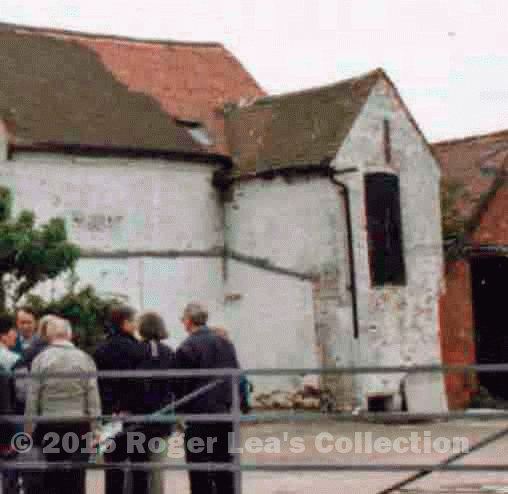 Ben Davis, a descendant of Ben Styles, was the miller at New Hall Mill in 1977, when Queen Elizabeth II was sent bread made from New Hall Mill flour on the occasion of her Silver Jubilee, and the Friends of New Hall Mill did the same in 2002 for the Golden Jubilee. New Hall Mill is still in working order, and you can visit it to see the grain turning into flour on any of the open days this year, May 14th, May 29th, June 11th, July 9th, August 13th, August 28th and September 10th, 10.00 - 4.00. The granary at New Shipton Farm was only accessible by climbing a ladder to the black door. At the foot of the wall you can see the air intake for the furnace in the room below. This part of the farm, built by Twamley, was demolished in 2001.